Well the hardtweeting staff was just scrolling along when this turned up in our Twitter feed. Is it just us, or is this a whole new level of adtrusiveness? Then again . . . #NATLPancakeDay. 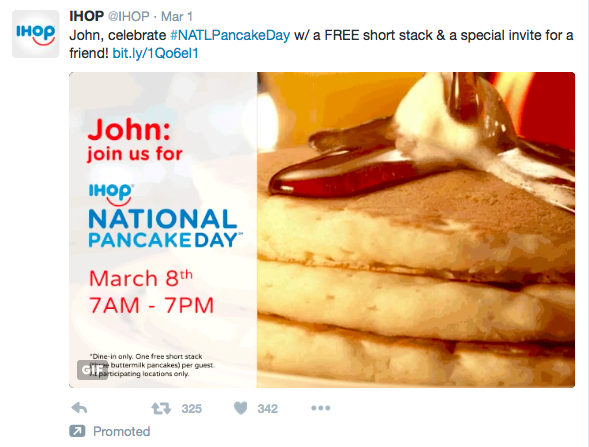 This entry was posted in Uncategorized and tagged #NATLPancakeDay, adtrusiveness, IHOP, International House of Pancakes, National Pancake Day, Twitter. Bookmark the permalink. Adtrusive or not, you got the invite. They ignored me. Eat more pancakes!